2. They are environmentally friendly so you can save money from constantly buying tissues. Save a tree, one blow at a time. 100% cotton. Hand wash in warm water is highly recommended. Lay flat to dry. Cool iron if needed. Made of 100% cotton crochet lace and 100% premium 60s cotton. 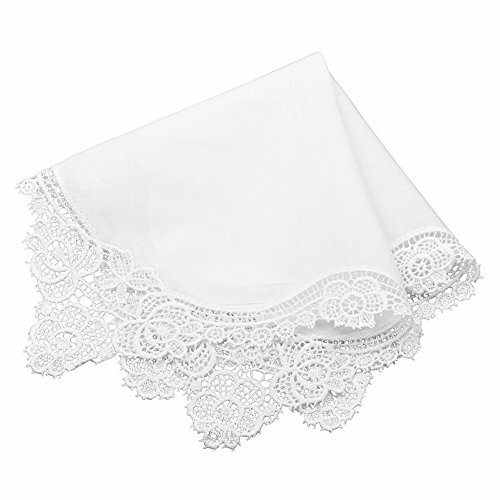 PACK OF ONE WHITE HANDKERCHIEF - The pack comes with one WHITE women's handkerchief with white lace edge design, lace surrounded all sides of the handkerchief. PREMIUM 60S COTTON - SOFTER AND GENTLER - These handkerchiefs have an "S" value of 60 (60s) as compared to the majority of handkerchiefs in the market of 30s or 40s. The higher the number, the thinner the fibers, hence the smoother and silkier the cloth feels. SO MANY WAYS TO USE OR GIVE AS GIFTS - Perfect gift for wedding favors（for the bride, mother of the bride, mother of the groom and/or bridesmaids）, "Thinking of You", Mother's Day present, thoughtful token for those who have experienced the death of loved ones, for graduation, or add it to a goody bag for afternoon tea or women's club meeting. DAINTY, LIGHT AND COMPACT - Each weighs only approx. 0.5oz, size approx. 11.5x11.5" (or 30x30cm). Whether you carry it in your purse or carry-on bag, it won't weigh you down and can be folded to take up very little space. Each hankie was pressed with light starch, so wash them before use. If you have any questions about this product by Milesky, contact us by completing and submitting the form below. If you are looking for a specif part number, please include it with your message.